Have you ever felt like whatever you do, you just can't get things done? Or too many interruptions come your way? Your head is somewhere else because something important is happening but you are stuck at the office? Maybe its time to consider asking your boss/manager to work remotely. Remember, you are not alone: 79% of workers want to work from home at least part-time. Some countries are more inclined to have remote work than others. US/Brazil and UK have high rate of remote workers. The culture of both the country and the company are essential to your chances of remote working. The first step is to figure out if remote working is really for you. You have to tap into your better judgement: are you willing to work from home, or is it just to get away from the office? Do you actually think you'll perform better, or will you just procrastinate even more? If the intent to work from home is greater than the intent to perform great work, then working remotely might not be in your best interest. Once you've decided: take a look at your company's remote work policy (if there is one) and talk to one of your colleagues who already does remote work.You will need to give good argumentation and highlight the benefits for your manager (and the company), so you will have to dig into that. Gather reports from co workers for whom remote working worked, get data from your HR department, the internet (here is an awesome one). Of course, you would need to have proven yourself a responsible employee that does not need monitoring. Research shows that tech-savvy aged 36 to 45 years old are most likely to work from home, and that remote workers have been in their company for 3 to 5 years. Remote work will kill two stones at a time; you will have more time for yourself (or for working depending on how dedicated you are), because you will not have to commute. And you will also save the money you would have spent either in gas or public transportation; savings range from $2000 to $7000 yearly. Some study reports that home workers performing repetitive tasks experience a 6-10% drop in their productivity. In the opposite, they were 11-20% more productive when working on creative tasks. So if your work requires creativity, you will greatly benefit from working from home. Since you won't have to commute and that you'll be home more often, you will have more time for family. You can go pick up your kids, eat with you wife, take your dog for a walk. Actually walking is good for you and your career. Many successful team fully work remotely: Buffer, KISSmetrics, Automattic, just to name a few. These teams are fully dispersed, so working remotely was not an option, but they managed to collaborate remotely heavily relying on collaboration and communication tools. You could work from your home, given that you have a dedicated "office" space or place for that. But you can work from anywhere that has wifi (or not depending on your tasks). So get creative, go to the park to get fresh air and fresh ideas/perspective on things, go to a coworking space to meet new people and exchange point of views, you might learn interesting things and come up with new ideas. You can work while on a trip (in a plane; train, boat). Or you can use that day to visit relatives. Soon you even might be able to work from a self driving car. And if you really feel like it, go to the wild, the woods, the beach. Just make sure you have a 4G/3G device powering your laptop with internet if necessary and the world is yours. Your company surely does already have cloud solutions implemented, such as Google Drive, One Drive ou encore Dropbox, because of all the proven benefits is has on productivity. Cloud is meant to be accessible from anywhere, so use it to its full potential. Working remotely will require you to master you cloud solutions and heavily share files with coworkers. If you are reading on this blog probably means you already are familiar with Azendoo. So you already know one of the best collaboration tools out there. Transparency in remote work is essential. You need to be able to show everyone what you are working on, what you have achieved, and what you plan on doing next, as well as access your teammate informations. With Azendoo, everyone can see your todo list and comment on your tasks. You can share files and messages on an Activity thread for everyone to see, and even post on dedicated subjects with restricted users when informations is not relevant for everybody. If you don't use social collaboration software already, you're missing something. Find the one most appropriate to your needs and use it daily with your team. It is proven that remote working increases productivity. So both you (your career and achievements and recognitions and more) and your company have good reasons to make it happen. Not only you will be more productive, but you will also be happier. People who work remotely are less likely to quit their job, are more satisfied with their company, communicate better, and have better opinions about their managers. Add more family time, less frustration, more flexibility to the equation and it all adds up to a happier life. It is a growing trend. 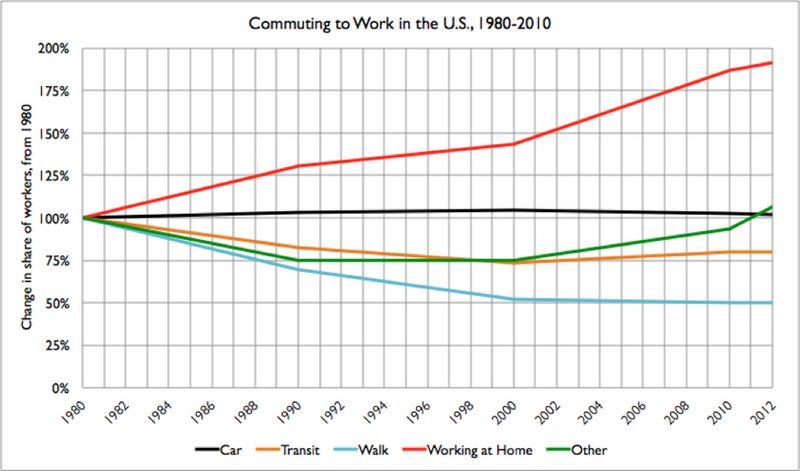 The number of US workers who telecommute is consistently growing; and has almost doubled between 1980 and 2012. 24% of total US workforce telecommute at least some hours each week, while in UK it is one tenth of the total workforce (2.8 million workers). With the development of solutions for remote collaboration, it is likely that these numbers will keep on going up. While working remotely, you gain in flexibility. You can pick your work hours, take better breaks, eat healthier food. You will work at your own pace and achieve more on your terms. You will sleep more and be healthier and happier. Overall, remote working has many benefits and boost your career and family life. So get to act now and go ask your boss to start remote work today! And if you think that it might affect your motivation, read this article on how to stay motivated when you're working remotely. Want to add something to this story? Share it with us in the comments below.